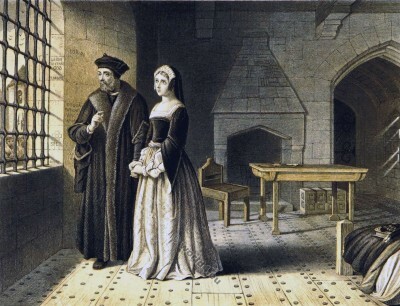 SIR THOMAS MORE AND HIS DAUGHTER. Amidst the number of remarkable men associated with the historical events of the reign of Henry VIII., not one was more truly distinguished than Sir Thomas More. His blameless life and tragic death are subjects of which few Englishmen tire to read, and the tender affection that existed between him and his noble and accomplished daughter Margaret, makes one of the most charming episodes in the story of English life and character of that period. More’s father, who occupied a place on the judicial bench in the reign of Henry VII., placed his only son at a school of high repute in Threadneedle Street, London, whence the lad was received into the family of Cardinal Morton, who was chancellor and Archbishop of Canterbury. The extraordinary talents, and probably that acute, ready, and pleasant wit for which he was afterwards famous, gained for him the notice of the distinguished visitors to the chancellor’s house; so that when at the age of seventeen he went up to Oxford to study rhetoric, logic, and philosophy, in order to qualify himself for legal practice, he may already have had the prospect of that great career which began when he afterwards entered New Inn and then removed to Lincoln’s Inn. At Oxford young More became acquainted with Erasmus, between whom and himself a close friendship afterwards existed, and it was there that he composed the greater number of his English poems. More was one of those rare men in whose characters are combined great scholarship, brilliant wit, and earnest religious sentiments. He was always a student of theology, and for some time thought of entering the church, but he finally relinquished that intention, and was called to the bar. His religious opinions were strong, and his personal piety remarkable. As a Roman Catholic he practiced penance and self-mortification with austerity, conforming to the practices of the charter-house where he resided. He was an earnest upholder of the church and of the faith which he professed, so that he doubtless afterwards became associated with the persecutions inflicted on Protestants. Mr. Froude says, “The philosopher of the Utopia, the friend of Erasmus, whose life was of blameless beauty, whose genius was cultivated to the holiest attainable perfection, was to prove to the world that the spirit of persecution is no peculiar attribute of the pedant, the bigot, or the fanatic, but may co-exist with the fairest graces of the human character.” It is doubtful, however, whether he was ever concerned in the infliction of death upon those whom he regarded as heretics, though he declared to Erasmus that he would give them all the molestation in his power. More soon obtained an extensive legal practice, and was frequently engaged by leading merchants in foreign arbitration cases, which took him to Flanders, where he made many friends. He was appointed under-sheriff of London, and so became a judge in the sheriffs’ court, and his reputation was so great that he was always engaged in important trials. On becoming a burgess, and taking his seat in parliament, however, his honesty had nearly ended his career, for he opposed the attempt made by Henry VII. to raise a subsidy on the occasion of the marriage of his daughter to the Scottish king. This so incensed the king that More had determined to leave the country, when the death of Henry VII. and the accession of Henry VIII. restored him to safety. Then followed a succession of honors and royal favors, none of which appear to have changed the simplicity and piety of More, or to have affected his love of truth and honesty. In 1515 Henry employed him on an embassy to Bruges, and in the following year conferred on him the honor of knighthood; but More refused the offer of a pension, on the ground that, when acting as judge in any dispute between the crown and the city, he would probably be embarrassed by the knowledge that he was taking the money of one of the parties concerned. He had married Jane Colt, an Essex lady, who died, leaving a son and three daughters, one of whom married Mr. Roper, and was the chief stay and comfort of her father in his last years; though he had again married. His second wife was Alice Middleton, a widow some years older than himself. When Henry determined to marry Anne Boleyn, and to be divorced from Catherine, no persuasion could induce More to give his approval. He remained neutral, and resigned his office of chancellor,after having held it for two years and five months. From that time the king, whose resentment was furious against all who opposed him, determined on either overbearing or ruining his former favorite. 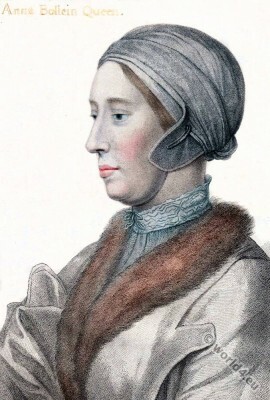 More was included in the charge of favoring the “prophecies of Elizabeth Barton,” the maid of Kent, who,from general foretelling of events which did not happen, had been induced by some of the priestly party to denounce the divorce from Catherine. A number of innocent persons whom it was desired to get rid of were included in a bill of attainder for upholding this pretender, and More was one of them, but his innocence was so obvious that his name was afterwards removed, and he was required only to take an oath to maintain a statute passed in 1533-34, which made it high treason by writing, print, deed, or act, to do anything to the prejudice of the king’s lawful matrimony with Queen Anne. More declined to take the oath, but offered to swear that he would maintain the order of succession as established by parliament, for the exclusion of the Princess Mary from the throne. He was therefore attainted of misprision of treason, and was conveyed to the Tower. He had already given up his preferments, obtained places for his servants, retired from his home at Chelsea, and had become so poor that there was little to take from him but his life. For thirteen months he remained in prison, and neither the urgent reasoning of his friends, nor appeals on behalf of his family, could induce him to act in opposition to his convictions. Dear Margaret was distracted; when he had remained about a month’s space in the Tower, she, longing to see her father, made most earnest suit, and at last got leave to go to him. At which coming, after they had said together the Seven Psalms, and Litanies, among other speeches he said, “I believe Mag, who have put me here think they have done me a high displeasure; but I assure them on my faith, mine own good daughter, that if it had not been for my wife and you, and my children, I would not have failed to have closed myself in a straiter room than this; nor since Iam come hither without my own desert, I trust God will discharge me of my care, and with his gracious help supply the want of my presence to you,” and much more he said of gratitude that he should be counted worthy to follow in the army of martyrs. She plied him with family reasons for concession, but he replied patiently but firmly in the negative. Once after questions about the home people, he asked how Queen Anne did. “In faith, father, never better,” said she; “there is nothing in the court but sporting and dancing.” “Never better!” he replied; “alas! Mag, alas! it pitieth me to remember into what misery, poor soul! she will shortly come. These dances of hers will prove such dances that she will spurn our heads off like footballs, but it will not be long ere her head will dance the like dances.” Fisher, the aged bishop, the friend of the king, the supporter of learning, was already dead on the same charge. While he lay in the Tower a cardinal’s hat was sent to him from Rome. “Ha!” exclaimed Henry, ” Paul may send him the hat, I will take care that he have never a head to wear it on.” He kept his word. On the 22d day of June, 1535, the old prelate was dragged from the Tower, his gray head severed from his body and stuck upon London Bridge, whence it seemed to look towards the Kentish hills. His body was exposed naked to the populace, and then placed ina humble grave in Barking churchyard, without coffin or shroud. After a year’s imprisonment, he was led out of the Tower to be tried at Westminster Hall for high treason. There he stood calm and undaunted, his hair white, his face pale and emaciated, his dress a coarse woolen gown; his strength so reduced that he had to support himself on a long staff. His judges feared his uprightness and eloquence. The indictment was long and wordy: even then he might obtain pardon by doing the king’s will. This he refused, and in his defense showed that there was no foundation for that of which he was accused. Rich, the infamous solicitor-general, deposed that More had said in a private conversation: “The parliament cannot make the king head of the church, because it is a civil tribunal without authority in spiritual matters.” More denied the accusation, and remarked upon the character of his accuser. Two witnesses brought to substantiate the charge declared, that though they were in the room they did not pay attention to what was said. At last it was declared, though More had remained silent on the matters demanded of him—that silence was treason—and he was sentenced to death. As he moved from the bar, his son rushed through the hall, fell upon his knees,and begged his blessing. With the axe turned towards him he walked back to the Tower, amid the great wonderment and commiseration of the citizens. On reaching the Tower-wharf his dear daughter, Margaret Roper, forced her way through the officers and halberdiers that surrounded him, clasped him round the neck, and sobbed aloud. Sir Thomas consoled her, and she collected sufficient power to bid him farewell for ever; but as her father moved on she again rushed through the crowd, and threw herself upon his neck. Here the weakness of nature over came him,and he wept as he repeated his blessing and his Christian consolation. The people wept too, and his guards were so much affected that they could hardly summon up resolution to separate the father and daughter. After this trial the bitterness of death was past. The old man’s wit flashed brightly in his last moments. When told that the king had mercifully commuted the hanging, drawing, and quartering into simple decapitation, he said, ” God preserve all my friends from such royal savours!” This happy vein accompanied him to the very scaffold. The framework was weak, and some fears were expressed lest the scaffold might break down. “Mr. Lieutenant,” said More, “see me safe up, and for my coming down let me shift for myself.” The executioner as usual asked forgiveness. “Friend,” said More, “thou wilt render me to-day the greatest service in the power of man; but my neck is very short, take heed, therefore, that thou strike not awry, for the sake of the credit of thy profession.” He was not permitted to address the spectators, but he ventured to declare that he died a faithful subject and a true Catholic. After prayers said, he placed his head upon the block, but he bade the headsman hold his hand until he removed his beard, saying with a smile, “My beard has never committed any treason.” Then the blow fell, and the neck was severed at once. 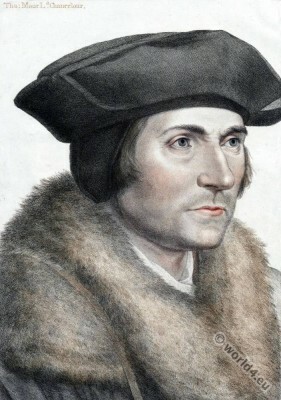 The body of Sir Thomas More was first interred in St. Peter’s Church, in the Tower, and afterwards in Chelsea Church; but his head was stuck on a pole, and placed on London Bridge, where it remained fourteen days. His eldest and favorite daughter, Margaret Roper, much grieved and shocked at this exposure of her father’s head, determined if possible to gain possession of it. She succeeded, and according to Aubrey, in a very remarkable manner. “One day,” says he, “as she was passing under the bridge, looking on her father’s head, she exclaimed, ‘That head has lain many a time on my lap, would to God it would fall into my lap as I pass under!’ She had her wish, and it did fall into her lap.” Improbable as this incident may appear, it is not unlikely that it really occurred. For having tried in vain to gain possession of the head by open and direct means, she bribed or persuaded one of the bridge-keepers to throw it over the bridge, as if to make room for another, just when he should see her passing in a boat beneath. And she doubtless made the above exclamation to her boatmen, to prevent the suspicion of a concerted scheme between her and the bridge-keeper. However some of these particulars may be questioned, it appears certain that Margaret Roper gained possession of her father’s head by some such means, for when summoned before the council for having it in her custody, she boldly declared that “her father’s head should not be food for fishes.” For this she was imprisoned, but was soon liberated and allowed to retain her father’s head, which she had inclosed in a leaden box, and preserved it with the tenderest devotion. She died in 1544, aged 36, and was buried in the Roper vault,in St. Dunstan’s Church, Canterbury; and, according to her own desire, her father’s head was placed in her coffin. But subsequently, for some cause not now known, it was removed from its leaden case, and deposited in a small niche in the wall of the vault, with an iron grating before it, where it now remains in the condition of a fleshless skull.